Hello there, I hope you all had an amazing summer! I can’t believe it’s been 4 month already since my last post and I missed the whole season of good weather & fashion; thank God I had been to something great and I am so excited to be back online! Fall weather has just kicked in here I wore my first fall outfit shown above this Monday. The sweater dress is by Ivanka Trump via Marshalls. It’s got some striking contrast seaming accents that I have never seen before and I am completely in love. It’s very delicate though I have to treat it like a baby :). 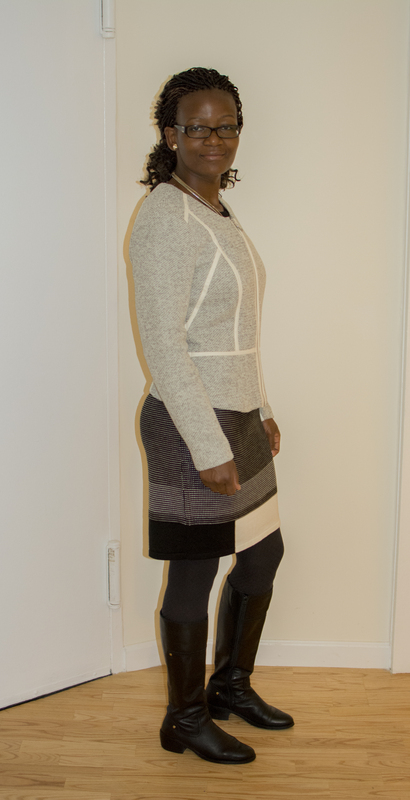 The short H& M jacket is made of melange fabric with patterns that goes really well with the dress. It’s my first jacket from H&M and is seems to be coming my favorite piece this fall, its available in store and online here. Thanks for visiting, enjoy the rest of your week!